The Short Version: If you want your date to take off, you should pay a visit to the Albuquerque International Balloon Fiesta, a one-of-a-kind festival in the heart of New Mexico. During the nine-day event in October, over 550 colorful and whimsical hot air balloons launch into the skies and create a remarkable sight for residents and tourists alike. The Balloon Fiesta is the world’s largest balloon festival (with over 850,000 attendees), and it’s on the bucket list of many flight enthusiasts, photographers, and world travelers. Couples can linger for hours talking to pilots, learning about balloon travel, and enjoying unique shows and competitions in the 78-acre Balloon Fiesta Park. Since 1972, this world-class festival has wowed attendees with coordinated launches, balloonist competitions, and nightly shows. You and your love interest can be swept up by the romantic and colorful atmosphere at the annual Balloon Fiesta. Every October, hundreds of hot air balloons fill the Albuquerque sky with color. Many couples sit on blankets or lawn chairs in an open field to watch teams of professional balloonists launch bright-colored, eye-catching balloons into the air. Thousands of people on the ground wave to the lucky folks riding aloft in a floating parade like no other. 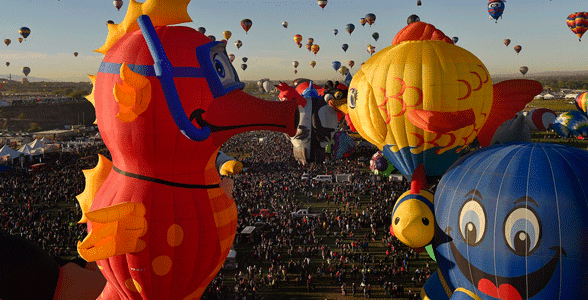 The Albuquerque International Balloon Fiesta offers nine days of imaginative entertainment. You can take a date and hang out all day talking to pilots and watching balloons of every color take to the skies. From early morning to late evening, the festivities give people something to see and do together. The Balloon Glow, AfterGlow™ Fireworks Show, and other nightly shows dazzle attendees with beautiful, high-tech demonstrations. Attendees can marvel at illuminated hot air balloons as the sun goes down or enjoy a high-tech laser light show under a canopy of stars. The Albuquerque International Balloon Fiesta is a beloved annual event in the Land of Enchantment. The annual Balloon Fiesta is packed with fun things to do and see. You can spend day after day watching balloon rodeos, listening to live music, munching on street food, and talking to balloonists at the world’s largest balloon festival. Plus, if you’re looking for a way to sweep your date off his or her feet, you can take a balloon ride with Rainbow Ryders. These are highly coveted spots, so you’ll have to book early to reserve your seat. Whether you’re there with your family or a date, it’s easy to get carried away (sometimes literally) during this spectacular nine-day event. In 1972, an Albuquerque radio station was about to reach its 50th anniversary, and the team wanted to celebrate in style. They reached out to a well-known local pilot who gathered his friends to launch 13 hot air balloons on the big day. On a clear afternoon, an excited crowd of flight enthusiasts stood in a shopping mall parking lot to watch the balloons take to the air. The event was so impressive and well-received that the organizers decided to make it an annual tradition, growing it into the international affair that it is today. Over the years, it took on a life of its own, and now a nonprofit organization, which includes 13 paid staffers and hundreds of volunteers, organizes the yearly fiesta. Today, the Balloon Fiesta launches over 550 hot air balloons every October, weather permitting. 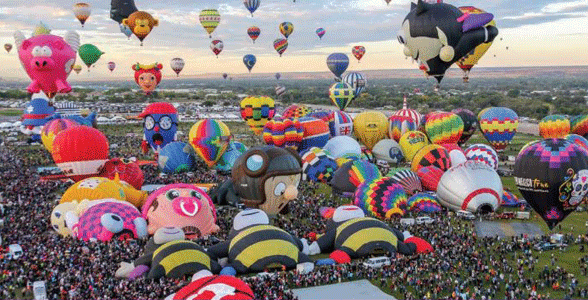 This unique event takes place at Balloon Fiesta Park, a 78-acre space where over 850,000 balloon enthusiasts, sightseers, families, and couples gather to enjoy the largest ballooning event anywhere in the world. 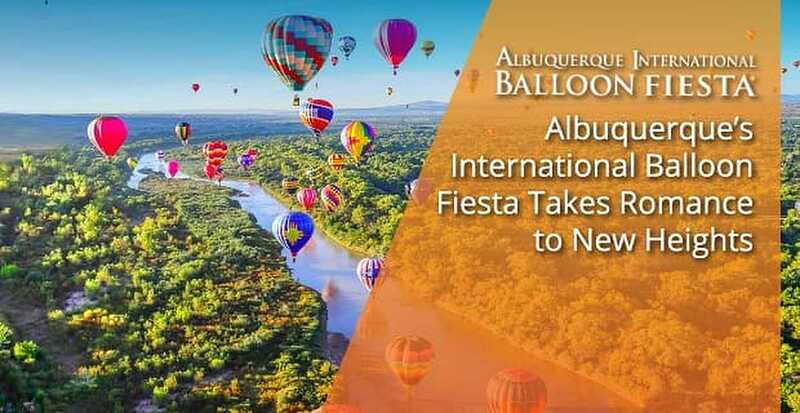 The next Balloon Fiesta will start Oct. 6, 2018 and run until Oct. 14. General admission tickets cost $10 per person and include entrance to the event as well as all on-site activities during the morning or evening of your visit. The park opens at 4:30 a.m. every morning and again at 3:30 p.m. for five evenings. If you come in the morning, you’ll have to buy another general admission ticket to return in the evening. If you’re driving to the event, you can pay a little extra for parking tickets. The Balloon Fiesta also offers park-and-ride tickets that include round-trip transportation to and from the Balloon Fiesta Park from five shuttle locations in the city. That way, you and your date can skip all the traffic and get straight to the fun part. You must purchase these tickets online before the event starts, and all tickets are non-refundable. The Albuquerque International Balloon Fiesta claims the title of the world’s most photographed event, and it’s easy to see why. Hundreds of hot air balloons of all shapes and sizes drift across the sky like multi-colored clouds. You can’t see that anywhere else. From wacky and cartoonish creations to more traditional checkered designs, the balloonists show off their creativity in hopes of impressing large crowds of locals and tourists. The event’s early-morning Mass Ascensions give people a reason to wake up early, down a cup of coffee, and head to the park with a breakfast burrito in hand. At 7 a.m. on the dot, professional balloonists coordinate with one another to launch their balloons one by one until the sky is filled with 550+ balloons. These launches take place on Saturday and Sunday of both weekends during the Balloon Fiesta. The Mass Ascension is a breathtaking sight and takes a tremendous amount of skill and knowledge to pull off. Fortunately, the Balloon Fiesta has trained launch directors, known as zebras because of their black-and-white uniforms, to make sure the event runs smoothly and safely. During the festival’s Mass Ascension, hundreds of hot air balloons are coordinated to inflate and launch in two waves in a spectacular display of color. The Balloon Fiesta is an event like no other, so it’s a wonderful place to create special memories with that special someone. During the event, you can walk among the balloons and talk to the pilots, who are only too happy to explain the inner workings of air travel. Their passion for ballooning is positively infectious, and people can’t help but be impressed as they stand among towering balloons of all colors. There’s so much to do from sunup from sundown. Event attendees can enjoy a music fiesta, film fest, chainsaw carving competition, balloon rodeo, and other special programs on the fairgrounds. Over 90 vendors and concession stands on Concession Row tempt people to grab a snack or a souvenir as they tour the area. Need a conversation starter? Then you can pay a visit to the north end of Main Street where the Balloon Discovery Center showcases interactive exhibits that outline the history of ballooning and the science behind how it works. Over 30,000 visitors stop by this educational center each year, making it the most popular attraction at the festival. From the launch of the Dawn Patrol at 6 a.m. to the fireworks spectacular at 8 p.m., the Balloon Fiesta presents an action-packed day of awe-inspiring shows and memorable sights. Over 850,000 people attend the nine-day event, and they come away knowing they’ve witnessed something special. Many people over the years have decided to take advantage of the Balloon Fiesta’s romantic atmosphere by proposing to a significant other or planning a wedding at the event. Nik West, a bassist who once opened for Prince, announced she plans to tie the knot at the Balloon Fiesta. The purple-haired bride aims to have a non-traditional wedding surrounded by hundreds of hot air balloons. If you’re in Albuquerque around mid-October, all you have to do is look to the skies to feel a sense of wonder. From anywhere in the city, you can see hundreds of hot air balloons floating against the backdrop of the Sandia Mountains. You can go on a lighthearted date at the Albuquerque International Balloon Fiesta and see spectacular sights from the ground and from the air. This nine-day extravaganza wows people of all ages. In the morning, as 550+ balloons take off one by one, a sense of awe descends upon attendees. Then, at night, couples snuggle up together under blankets as the park becomes aglow with the light of propane fires from hundreds of static balloons. The Balloon Glow is popular among couples going out on a special date night. The Balloon Fiesta offers a fun, lively, and unique date venue for couples looking for something outside the dull dinner-and-movie routine. Whether it’s your first date or your 40th wedding anniversary, you’ll have a phenomenal time taking in the sights of the Balloon Fiesta.